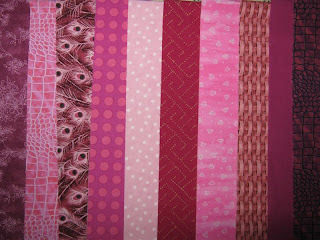 Another gift quilt, since pink is not my colour, though I've had the urge to make a pink quilt, so making it as a gift is ideal. 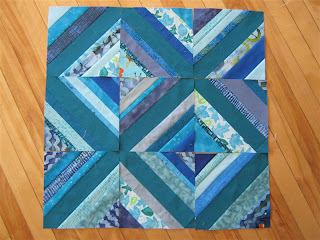 This one will be a Disappearing Nine Patch (Tutorial here). 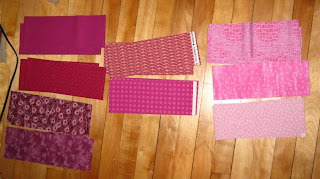 Bought all the fabrics before christmas, but am only now getting to the sewing part. I cut everything into 4" strips. 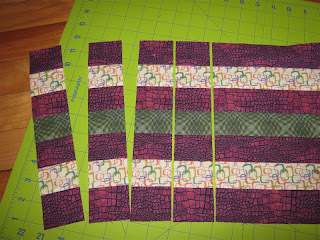 I'm sewing together some of these strips in groups of 3 to save some piecing work. 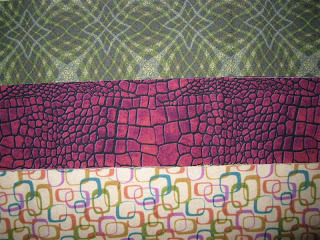 I'm only using fabrics that I have lots of. 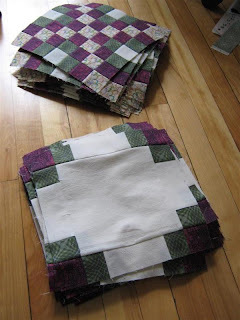 For the other fabrics, I'll sew individual squares or use half a strip. I guess I can be pretty random when piecing the different hues and patterns, as everything will be mixed up again when the Nine Patches are cut to make the Disappearing Nine Patches. 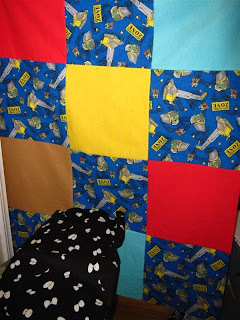 Here's the beginning of a quilt that I'm planning for my little nephew. 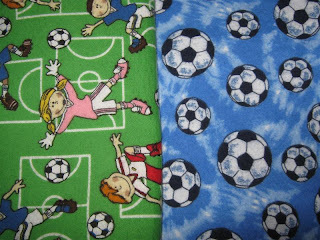 He really loves soccer, and I found some soccer-themed flanelette. 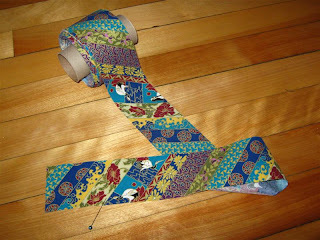 I hope it won't be too staticky, but I'd like to make both top and back from flanelette, for a softer, kid-friendly feel. He's probably still young enough to think those flashes of lightning under the blanket at night are fun. Right now my plan is to make a soccerball with the proper soccerball pattern (a dark pentagon surrounded by light hexagons). The dark patches will be black flanelette, the light hexagons the blue soccer ball flanelette. The green will be the background, so that it looks like a soccer ball on a soccer field. That's the plan, anyway. 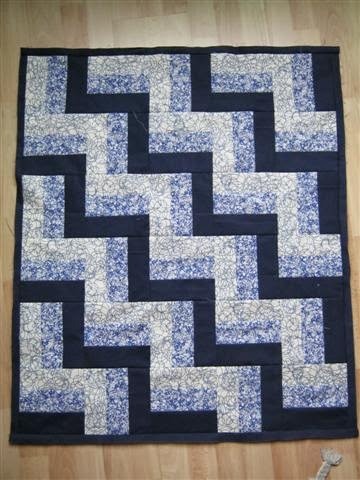 Another nephew, another quilt... This one loves heavy machinery and is going through a vampire phase. So when I saw the "Construction Zone" flanelette along with the glow-in-the-dark eyes flanelette, I thought bingo! 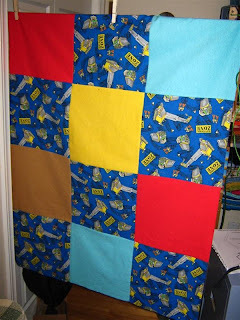 I decided on simple, big patches of the construction zone fabric and bright solid colours for contrast and to make it interesting to a little boy. It's probably been the simplest quilt I've pieced so far. I'll put a border around it and that's it for the top. It'll get free-motion quilting all over, in black thread that stands out on the top and blends in on the back. Here's the backing material, with those great glow-in-the-dark eyes. I should probably test if they actually do glow in the dark... A strip of black on the top and the bottom (I bought the last of the fabric and it's not long enough), black for the binding and that ones done in time for the little guy's birthday. 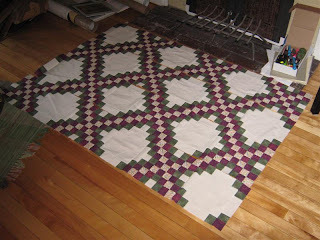 Very satisfying quilting.. 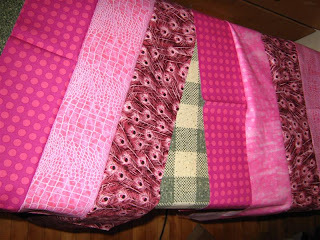 Here's a lap quilt that I might keep or give away, haven't decided yet. While buying fabrics for Hunter's Quilt, I came across a cute owl-themed flanelette. It's not really a boy's pattern, at least not by societal standards (not blue enough? Not enough machinery on it? 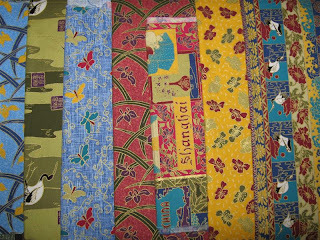 ), but I liked it so much, I decided to make a lap quilt out of it and see where it leads me. 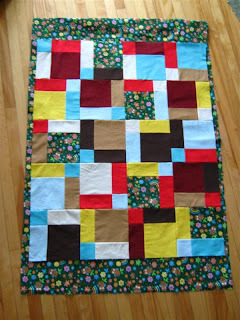 I decided to use a disappearing 9 patch pattern that I heard about on CrazyMomQuilts' blog, one of her readers pointed out this awesome tutorial on turning this quilt into an easy-peasy piece of work. 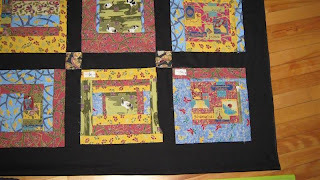 I used 7" squares for the 9 patches, so that I ended up with 9.5" final blocks (all seams sewn). 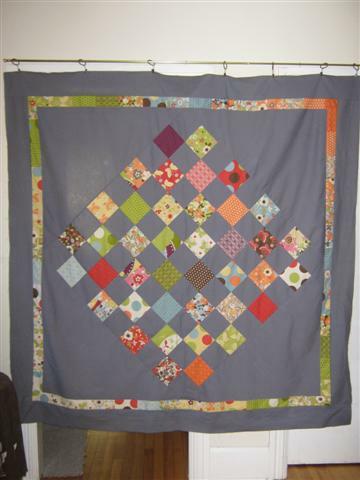 I'm still deciding whether I like the broad strips on top and bottom (to make the quilt a bit longer). Not sure if I like the owl block on the top running into the border. It's kind of neat, but I'll have to see whether it'll grow on me or not. I want to say "let me know what you think in the comment section", but who knows if anyone is even reading this blog? 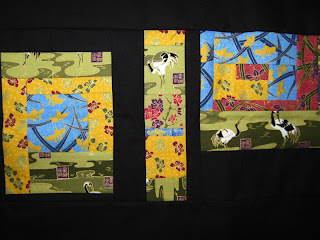 It's so new - I only started a week ago, just back-dated the blogs to when I actually made the quilts. 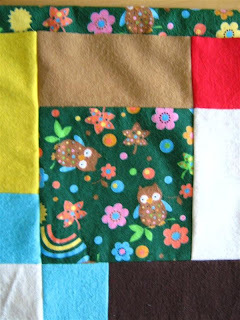 I love the owl material - it so cute! These oggle-eyed birds make me smile. I do have a friend who likes birds and cute things, so this quilt will probably not stay with me. 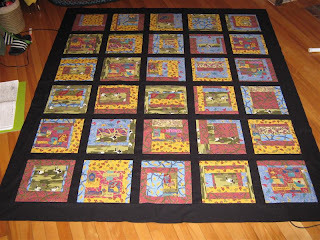 I planned this quilt right after I finished a double irish chain in my first quilting class and chose the colours in September 2008. My favourite colour is the bottom one with the retro-looking rounded squares. I bought the other colours to match. 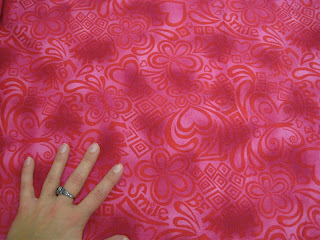 What I love most about quilting, is figuring out the pattern. 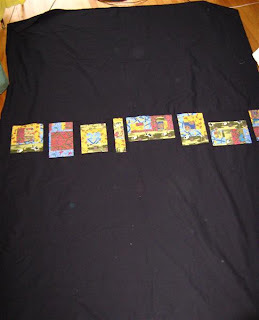 I have a hard time following patterns from books etc, so what I usually do is look at a picture of a quilt, then decide on the size squares I want to use and figure out all my measurements and numbers. 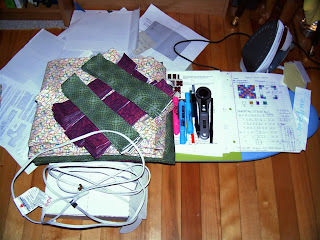 You can see some of my notes next to the fabrics in the photo above. It takes a while, but I really enjoy this. 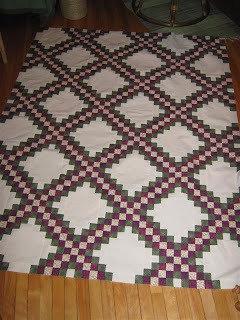 For this quilt for example, I decided to have smaller squares than I used for the double irish chain quilt (2.5" strips) and cut 2" strips, so that I'll end up with 1.5" squares making the pattern on the final quilt. 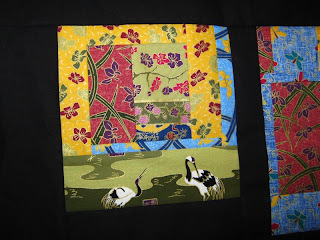 I started cutting and strip-sewing, but hadn't picked the colour for the large patch (see bottom blocks, off white material) yet, as I was trying to find a perfect match for the background of the multi-coloured material. As you can see, I eventually gave up and went with unbleached cotton - I think I actually like this better as it pops the pattern out more. 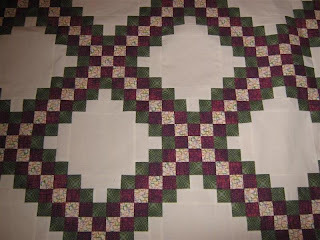 So this February, I had all the fabrics together and got serious about triple chaining. Except, not serious enough. 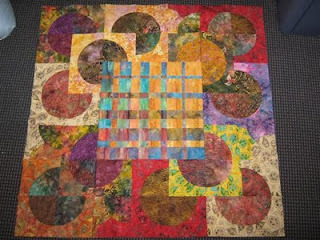 Finished all the chain-blocks (pile on top of picture), but didn't measure them all, only the top one. So I based the measurement for ALL the type 2 blocks (pottom pile) on that one type 1 block. Big mistake. The amount of tugging and pulling and non-perfect corners I had to go through to make up 1/4 inch discrepency turned quilting from a relaxation-activity into utter frustration. 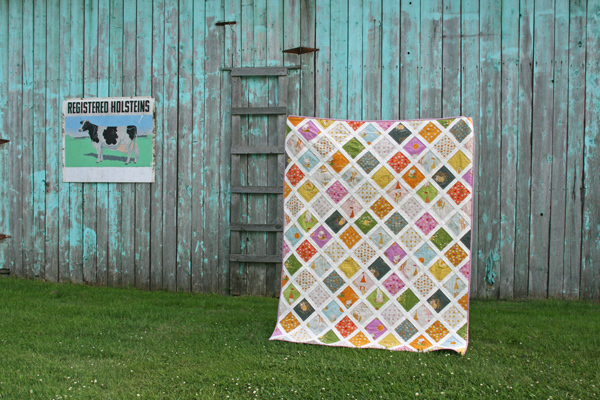 Hence the name Disaster Quilt - but I still love the pattern and the colours :). 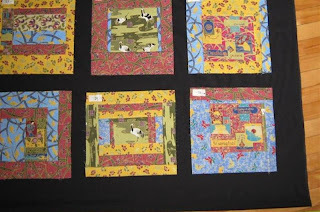 Here are the blocks for half the quilt lined up and laid out - I needed some kind of encouragment in the form of seeing it come together, so that I could keep going with this ardent task of really really stretching tiny cotton squares. And here is the whole top without borders, sewn together, ironed to my best ability (though quite bumpy due to all the tugging). 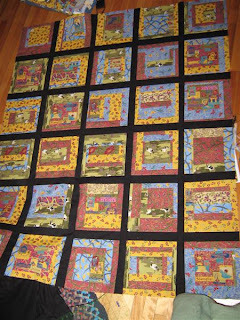 I then started to turn them into a wonky log cabin inspired by the County Fair quilt from MelanieMade (she has an awesome quilt blog, by the way!). So I happily sewed away, adding strips of all sizes, and trying to get some lopsided blocks, which I really like. 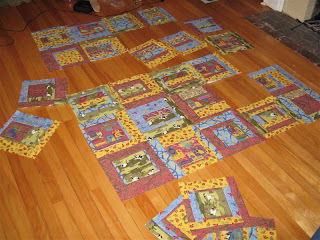 In the end, I had these 30 blocks (that's when I got really tired of log cabins), and they didn't turn out at all as I had envisioned - the fabrics were much too busy to put the blocks next to each other. It just didn't pop. As you can see, I decided against the fence post corners, cut lengthwise and it worked beautifully. I put a broader black border around it, and now doesn't it pop? Here's the binding fabric, I cut it diagonally, which was a pain and a lot of joining, but I still got enough out of 0.5m and it's redy to go whenever I have the energy to pin the quilt - a task I despise. I started working on this quilt in January, and I think it took me about 2 weeks to get to this stage. It's definitely been a feel-good process so far!